In the two year layoff in between records Norwegian outfit Dimmu Borgir switched a few people around, and kept practicing their instruments. Often dubbed the band’s finest moment “Stormblåst” is a slightly better paced, but still entirely confused folk-tinged dark metal album that is high on atmospherics but low memorable songwriting. The only worthwhile moments are the ones that were lifted wholesale from other composers, and much like “For All Tid” the band often cracks under the weight of its own symphonic pompousness. While the instrumentation had improved, the songwriting was still as poor and underdeveloped as it was before. Thankfully, the insufferable Stian Tomt Thoresen (Shagrath) hadn’t yet manned the microphone. Not so much an evolution from “For All Tid” but a mere variation of the same idea “Stormblåst” fully capitalized on the band’s symphonic aspect. Its connection and relation to black metal are tangential at best and non-existent at worst. “For All Tid” sounded more medieval and folk-tinged, whereas “Stormblåst” transitions headlong into romantic and symphonic spheres. The band never decides which type of atmosphere they want to convey. This results in a number of songs that differ wildly in mood and spirit, but hardly ever break free of the prevalent waltzy midpace tempo. 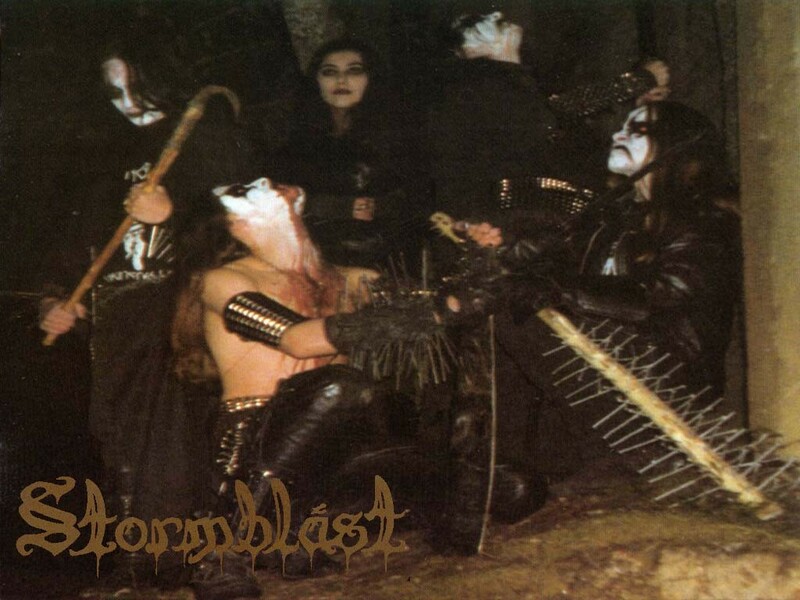 “Stormblåst” is the only record for British label imprint Cacophonous Records. It is the last to be sung entirely in the band’s native Norwegian and the last to display the band’s original logo. Incidentially it is also the only Dimmu Borgir record to feature artwork by Alex Kurtagić. The critical problem that plagued “For All Tid” still isn’t rectified on this second effort. Music and lyrics stand in complete opposition to each other. Hateful, anti-Christian lyrics tend to be hardly effective against a backdrop of toothless, and kind of plodding symphonic metal. None of it sounds very threatening at one point or another as the whole album is fairly upbeat, and even life-affirming in its usage of cheery melodies. This is bad enough by itself, but it is worsened by the completely disjointed and random nature of the band’s songwriting decisions. This would become a chief problem in the band’s major label output a few years after this record. Peculiar examples of this are ‘Alt Lys Er Svunnet Hen’ and ‘Guds fortapelse - åpenbaring av dommedag’ that are preceded by incredible sounding intros but are followed by ideas that have no connection, in atmosphere or in key, with the strong intro section that prededed them. The most severe problem of all is that these convincing moments in otherwise banal songs were lifted wholesale, sometimes without permission of the original composers, from other places. That the band was able to get away with such blatant thievery can probably be attributed to the simple fact that they weren’t as visible on the market then as they are today. Still the best sections of this record are the ones that are directly lifted from other sources. The atmospheric piano intro section to ‘Alt Lys Er Svunnet Hen’ was lifted in its entirety from the Magnum song 'Sacred Hour' from the 1982 album “Chase the Dragon”. ‘Sorgens Kammer’ is a cover of the theme song from the Amiga game Agony. Stian Aarstad not only stole the melody, but failed to inform his bandmates, or the composer of the original piece. The melody remains largely the same outside of a few superficial changes. Eventually composer Tim Wright rightly sued for plagiarism, which in a surprising turn of events didn’t result in Aarstad’s immediate termination. The only exception to the thievery is the classical intro to ‘Guds fortapelse - åpenbaring av dommedag’ that is sampled from Antonín Dvořák's Symphony No. 9 in E minor, Op. 95 ("From the New World") which was available in the public domain. Much like the band couldn’t decide on who to install as the vocalist the lyrics are split between former guest contributor Bjørn Dencker Gjerde (Draugh Aldrahn), Silenoz and Shagrath. Much, if not all, of “Stormblåst” appears as a work-in-progress – and given how Dimmu Borgir never formally demoed this is somewhat excuseable. Much like the band couldn’t decide on how they would like to sound, or who to position as a frontman - the band photo in the booklet features an earlier line-up including female bass guitarist Tanja who briefly substituted for Tristan, but did not record on the album. Her involvement, along with her last name, is curiously absent from any of the band’s official band history. To its credit the band was wise enough, perhaps through label influence, to record outside of Norway. The album was recorded in July and September 1995 at Endless Sound Productions with Charlie Taylor producing. It would be the only time the band would use this facility for any of its records. The album was released on Cacophonous Records in early 1996, the infamous UK label imprint that introduced the world to the likes of Bal-Sagoth, Cradle Of Filth, Primordial and Sigh among others. The label ended up mixing up tracks 7 and 8 in the tracklist. The original version of the album has an image of a frozen waterfall for the tracklist. The second version replaces the original image with a band member holding a sword. 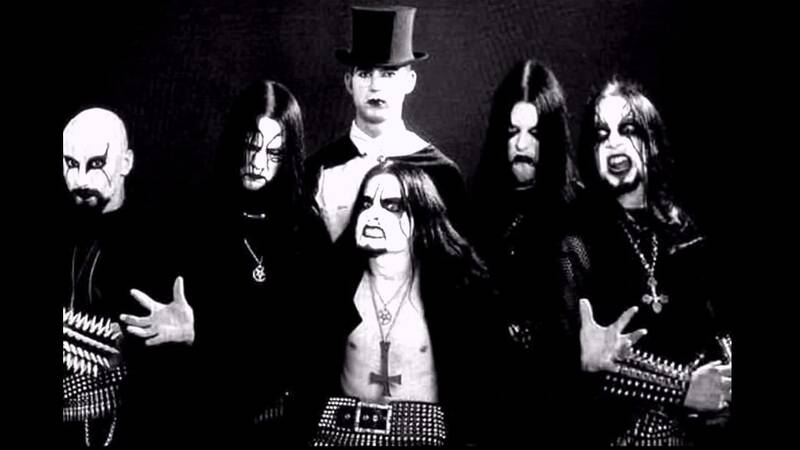 After the success of the album Dimmu Borgir would depart the label to sign with German conglomerate Nuclear Blast Records. 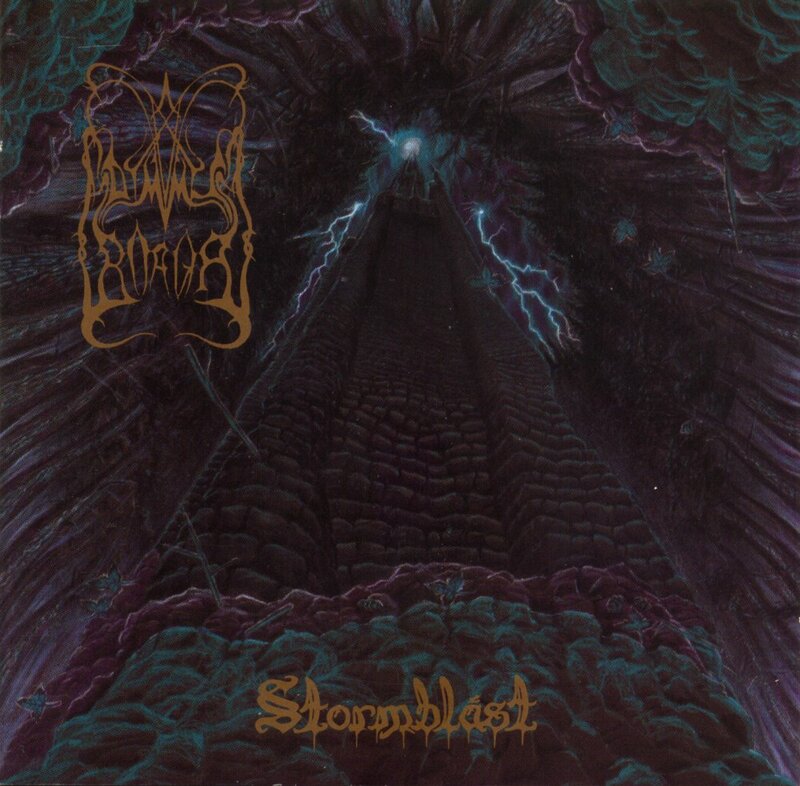 “Stormblåst” is probably the least offensive Dimmu Borgir record of this era. It wasn’t the badly paced, glorified demo compilation that was their inconsistent debut, or the symphonic experiment of the “Inn I Evighetens Morke” stopgap EP – nor is it the amorphous blob of conflicting populist metal styles that would come to define the Nuclear Blast era. This album is neither here nor there, and as records of this subgenre tend to go that is perhaps for the better. Likewise it is debateable whether Dimmu Borgir’s lyrics improved when they made to switch from Norwegian to English after this release. Much of “Stormblåst” is laborious, and what is present of songwriting climaxes (however few they may be) generally doesn’t warrant the amount of buildup that it takes to arrive there. For the only time the band worked with artist Alex Kurtagić, who was much in-demand at the time. Besides crafting the artwork for this album he worked with the likes of Ancient, Bewitched, Deinonychus, Sathanas, Troll and Throne Of Ahaz. That Dimmu Borgir was never a very good band was clear from the onset. Seldom does a band stumble into a recording deal without having decided which direction to take. This album marks the end of an era for the band, and its less than spectacular beginnings. It is perhaps fitting that instead of improving Dimmu Borgir actually deteriorated as its production budgets and visibility increased. The animosity towards Dimmu Borgir as a band is not unfounded as the majority of its output is simply terrible by any reasonable standard. “Stormblåst” isn’t a bad record by any stretch of the imagination, but it doesn’t set its goals particularly high to begin with. It isn’t worth the lavish praise it tends to receive in certain circles. It is an unassuming, slightly folkish, but highly atmospheric dark metal album that barely gets by on its second-tier status. Alas it is the sole highpoint to which Dimmu Borgir would be able to aspire. As wonderfully atmospheric as the record tends to be, it is abysmal on all other fronts – not even considering the blatant thievery by its creators, or the complete phoniness of its try-hard black metal imagery. Swiss unit Alastis was doing something similar at the time, but they never pretended to be something they were not. Dimmu Borgir wants you to believe that they are more important and better than they are, which they are anything but. It’s this dishonesty that completely sabotages whatever little musical merit and appeal they might have held. This feels more like a gentle breeze instead of being stormblown.